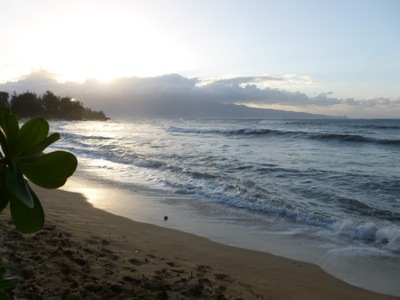 The north shore of Maui is the true Hawaii, the Hawaii of every surfer's dreams, of National Geographic photographs, the Hawaii of the imagination. The wind whips the palms and Norfolk pines, waves crash against the shore, rainbows are as ubiquitous and colorful as Haviana flip-flops. It's not the Maui of formulaic Kaanapali resorts and luau buffets, not the Maui of pristine Wailea beaches fronting five-star hotels where pool boys spritz you with Evian water. Until recently though, there was no decent place to stay on the north shore. You could rent a house or navigate the 600 curves and 66 bridges on the twisty Hana Highway to the Hana Ranch, now the Travaasa Hana, where if you were not on a romantic getaway or looking for solitude, you could go out of your mind. 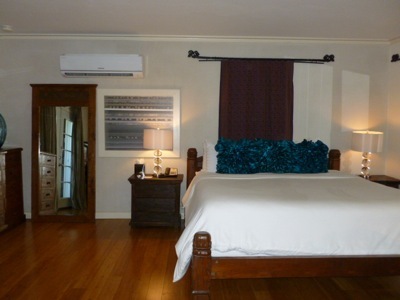 But the game has changed since the Paia Inn opened in the trendy town of Paia, just 10 minutes from the airport and smack in the heart of the north shore. One of the best things about staying on the north shore is that you won't have to fight the unbelievable traffic to get there. If you stay at the Paia Inn, you can check out hip little towns like Makawao and Haiku before or after the afternoon crunch, when the line of cars on Hana Highway stretches as far as the eye can see. The Paia Inn is on a beautiful beach, but if sand is not your thing, there's a verdant lawn overlooking the beach with comfortable chaise lounges and gratis snacks. In the winter, when the swells (as in waves, not Scott and Zelda) hit this side of the island, the beach is great for amateur surfers and boogie boarders; in the summer, the water is calm as a bathtub. The Inn is deceptively rustic from the outside with its wooden siding and tin roof; the owners have purposely retained the old Hawaiian architecture of its past when, in the 1920s, it was built as a rooming house for Japanese plantation workers. But the rooms are as contemporary as any hip boutique hotel anywhere: great beds and linens, chic island furnishings, travertine bathrooms, flat screen TVs, free wifi. There's even a three-bedroom beach house with a $1000/night price tag. The town of Paia has lots to offer: restaurants, cafes, an amazing health food store and stylish boutiques, which all seem to be owned by "designers" who came to Maui and fell in love with surfing champs. There's the Paia Fish Market for the freshest fish imaginable (the owner Moon's husband is a fisherman), the Flatbread for thin crust pizzas created with organic farm to table ingredients and a tasty salad dressing made with local pineapple, Ono Gelato for Maui-made Italian gelato created with fresh Hawaiian fruits, and Mana Foods for everything from avocados as big as grapefruits to half a dozen types of exotic organic mushrooms. Haiku, also on the north shore, is not as developed as Paia -- a couple of shops and a yoga studio -- but Nuka, the sushi bar recently opened by Moon, the owner of Paia Fish Market, might put it on the map. 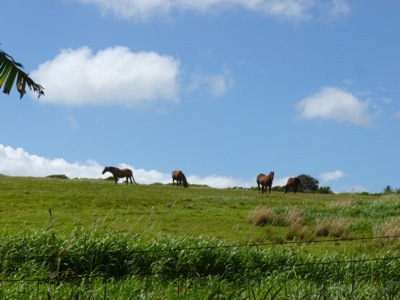 Makawao, located upcountry on the lush slope of the Haleakala volcano, combines its historic past as the home of the Maui cowboy with its present incarnation as a flourishing artistic community. At the Makawao July 4th rodeo, which has been a tradition for over half a century, local glass-blowers and painters mingle with paniolo, whose ancestors have wrangled cattle here since the 19th century.